Dead Rising 2 for the PC came out a year ago with a whole host of problems. Over a year later, Capcom releases Dead Rising 2: Off The Record with the SAME problems as the previous version! The biggest issue is the game not launching at all, leaving the player with an unknown error. Fortunately this crash has the same solution it did before. Solid Tip: This game has all sorts of crashing issues. In this fix, I will only deal with the most common one, which involves Capcom’s poor sound card support. When your game crashes it creates a crash report text file in its installation folder. If you are getting an error report that resembles the following ‘unknown location’, you need to adjust your sound card settings. 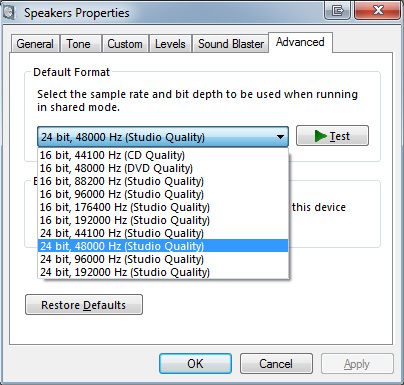 The game should immediately start once you change your sound card quality settings. You can reach the settings for your sound card through the Control Panel in Windows. For this example, I will show you a SoundBlaster X-Fi, which I configure by going to Sound > Playback > Speakers > Advanced. Here, I had my original quality set to 24 bit, 96000 Hz. To get the game to launch, though, I must set the quality to 24 bit, 48000 Hz. There is a second error that involves your sound setting also. In you get this error, set sound quality to 16 bit, 48000 Hz. Note that there have been various suggestions as to which sound setting will work for different people, so feel free to experiment with them. I Changed My Sound But It Still Crashes! Keep in mind this is a very poor PC port done by Capcom. One user with this same error found that the game would not launch unless it is installed on the C drive, or at least launced from a shortcut that is located on the C drive. Additionally, if you have had the game working before and it won’t launch now, try deleting the rendersettings.ini file under Documents\My Games\Dead Rising 2 Off The Record. Finally, reinstall GFWL and check the Steam cache for the game. Hopefully one of these tips will help you. For most users, simply changing the sound settings will take care of things. Thank’s you very much !! !